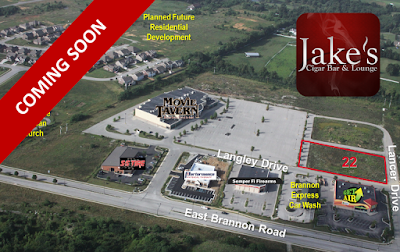 NAI Isaac is pleased to have worked with Jake's Cigar Bar on their footprint expansion within the Brannon Crossing development in Nicholasville, Kentucky. Jake's is expanding from an inline retail space to a freestanding building, to be constructed Fall 2018. J.L. Cannady, CCIM, Senior Associate with NAI Isaac, represented Jake's Cigar Bar during the sale transaction. John Miller, Assistant Vice President, assisted the Seller.